returning the cocoon wrap from this last post (which has been reduced again to £19!) and I picked up a few wee things..just can't resist those further reductions. First up, a couple of scarves. The 'Lightweight Botanical Floral' Scarf - I didn't name it, M&S did, clearly expecting that catchy name would sell them faster! Well, despite the name and the dodgy online photo it's sold out online but there were a few left in Sprucefield this morning for just £10. 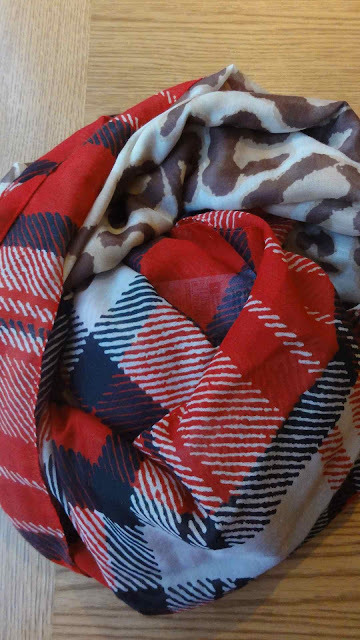 Like the reviewer on the website, I don't think the leopard and the check go particularly well together but if you tie it right, it does look lovely - it can be quite hard to find a nice scarf with red in it so I'm pleased with this one. Next up, some jewellery. In the sales, I never pass up a long silver chunky necklace. They go with everything and help to brighten up an otherwise dull outfit. This one was just £8 and I can only find it on the M&S Ireland site. 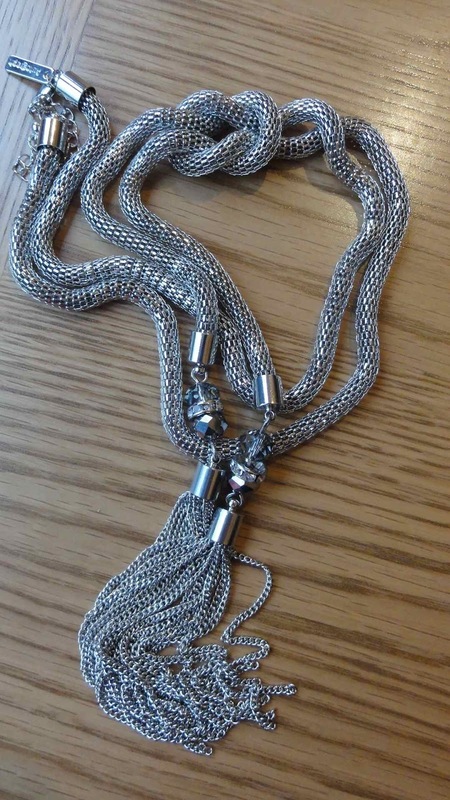 It's called the Autograph Twisted Y-Design Necklace. Finally, I only bought these because I am meeting a friend in the M&S Cafe on Monday so I knew I could easily return them and they were reduced to £9. 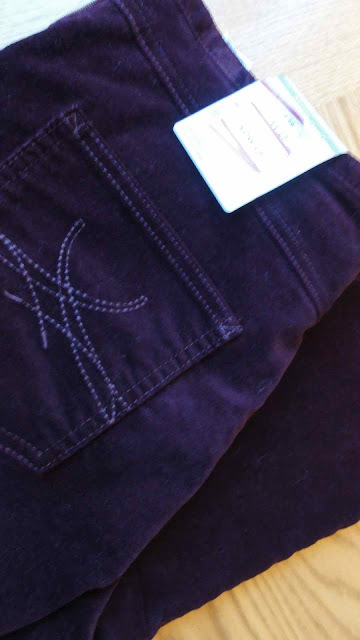 Brace yourself, they are Velvet Jeggings….two evil fashion words and surely not ever to be combined? Let's see - the official M&S photo is not giving me much confidence but they are a gorgeous aubergine colour and beautifully soft. Jury's out till I try them on later! And here's an outfit post I intended sharing on Thursday but the day kind of ran away with itself as we got ready for back to school on Friday. I talked about how I like to use my M&S layering vests to bring another colour into an outfit so I wore the pink one with a jersey cardigan in a putty colour and then added a gorgeous new scarf my godson sent me for Christmas which has both of those colours in it. 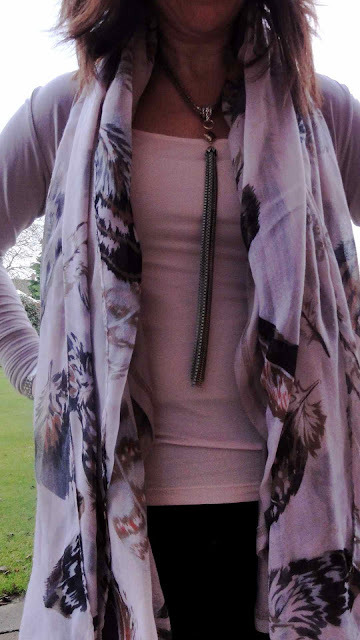 I also wore a Freedom @ Topshop necklace that my husband picked for me himself - well impressed as it's gorgeous! 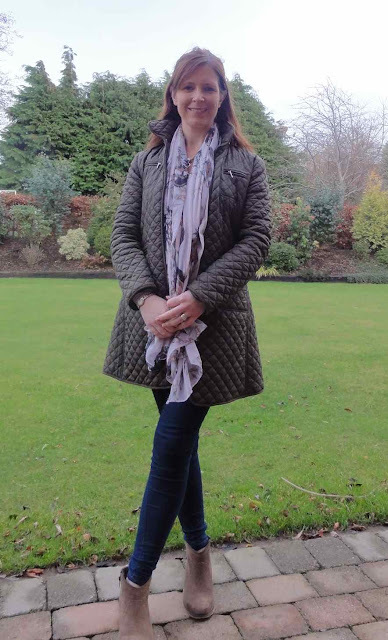 Don't think I've shown this coat on the blog before - I tend to take my photos without coats. This is an oldie from Hobbs. Bought for me by my sister in law, it's a perfect between seasons coat. The colour is a dark olive green and I was delighted to spot some of that colour in my new scarf - love it when a plan comes together..
Hope you're having a great weekend and remember, if you wear red this weekend, take a photo and send it to me for a chance to win a Radley cross-body bag! Full details on this link. It looks like you've had a successful sale shopping trip. I find M&S and bit of a hit & miss. Sometimes, there's loads I like and other times there's nothing. I love your jeggings! I suppose jeggings is a bad word, but I think they're divine! That scarf looks really interesting; look forward to seeing how you style it. I've stayed away from the sales in Dublin so far ... but now you're tempting me to have a little look tomorrow!! Hi there!! 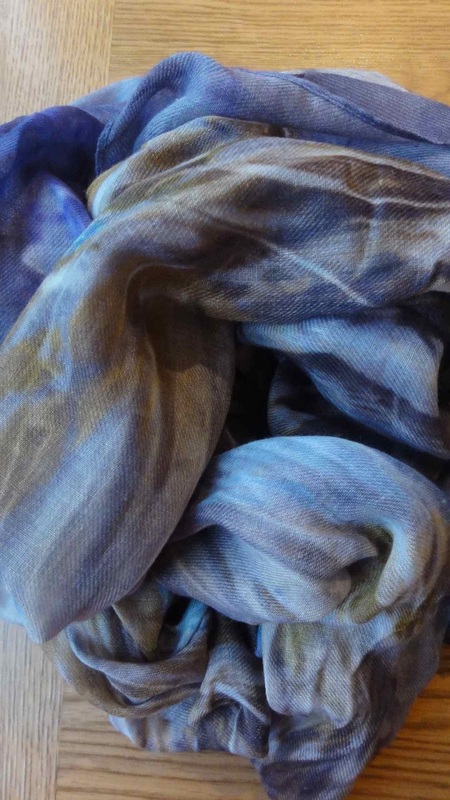 Love your blog and especially this post-a lady after my own heart who adores scarves!! These ones from M&S and your gifted one are really lovely and I too have rather a scarf addiction as shown in my latest purchase and post! have a great week ahead! Great scarves and lovely outfits. How do you manage to stay so slim? Your clothes always look so good on you I have started to do some exercise since turning 40 last year but it's always such an effort. My problem is the white wine I think. It has a tendency to hang around my middle. What's your secret? Thanks for your reply. Would you mind advising where to get a good support vest from please? Thank you Avril. Will definitely investigate those .